Good Luck Wake-Up and Lakota! Lexington, KY – The future of U.S. Dressage will be on display this week at the Lamplight Equestrian Center in Wayne, Illinois, as 59 of the most exciting rising stars go to task in the 2013 Markel/USEF Young & Developing Horse Dressage National Championships in conjunction with the Dressage At Lamplight August show, August 22-25. National Titles will be up for grabs in four-to six-year-old divisions as well as at the Prix St. Georges and Grand Prix levels. All horses will compete in a Qualifying Class which accounts for 40% of the overall score and a Championship Class which will determine the remaining 60%. A talented group of 14 developing horses have traveled to Lamplight with their sights set on earning National Titles over the weekend. Competition kicks off Friday with all entries performing the FEI Prix St. Georges Test. 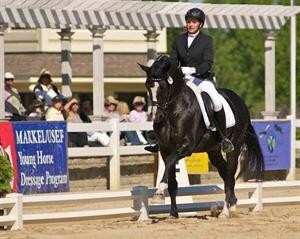 Championship competition comes to a close on Sunday with the USEF Developing Horse Prix St. Georges Test. Last year, Emily Wagner (La Cygne, KS) and her own AWR registered and licensed stallion Wake-Up (Wagnis x Maiden Montreal/Macho) were the second place finishers in this championship and will look to claim the Championship Title in 2013. The eight-year-old American Warmblood gelding already has a National Title to his name; in 2011 he earned top honors in the Six-Year-Old Championship. The pair currently stands second on the 2013 Markel/USEF National Developing Horse Prix St. Georges Dressage Championship Ranking List. Heidi Degele (Loxahatchee, FL) and the AWR-registered Lakota (Mick/Rena/Ludse) will be the second combination competing in this class as Alternate.